Excessive speed and drunk driving may be in the mix as possible causes in a fatal head on crash in Lincolnville, according to the Waldo County Sheriff’s office. The driver, Adam Knight, 31 years old, lost his life when he was ejected from his Volkswagen Jetta after it was split in half by the impact with a Kia driven by Priscilla Jones, 58, also of Lincolnville. “The accident is under investigation, and speed and alcohol are suspected as possible contributing factors,” Lt. Jason Trundy of the sheriff’s office wrote in an email. He added that police will share information as toxicology and reconstruction reports become available. Ms. Knight was extricated from her badly damaged vehicle by the local Fire Department. Her injuries are not considered life-threatening. Maine car accident lawyers at Hardy, Wolf & Downing point out that the Sheriff’s initial suspicions are not surprising. Studies show that most head on collisions in Maine occur on rural, undivided two lane roads and are most commonly found to be caused by an impaired driver. According to government studies, head-on collisions account for only 2 percent of all auto accidents, but they produce 10 percent of car accident-related fatalities. 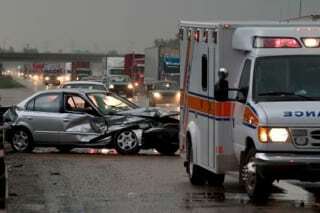 Head on collisions can be attributed to a number of reasons besides driving while impaired. Exercising poor judgment such as passing on a blind curve or hill or coming out from behind a slow moving vehicle like a truck or tractor can quickly turn into tragedy. Not proceeding with sufficient caution when visibility is diminished by bad weather is yet another possible cause of a head on collision. One of the most disturbing statistics in recent years has been the major uptick in distracted driving—texting, emailing, or dialing a phone while driving. Because head on collisions are by nature swift, unexpected, and often deadly, it is often difficult to assess responsibility for a crash where the causal factors may be complex and unclear. The head on collision lawyers at Hardy, Wolf & Downing have forty years of invaluable experience in cutting through the fog of tragedy and occasional misdirection surrounding fatal car accidents on behalf of their clients. Since a plaintiff in a lawsuit must be able to prove that he or she is entitled to compensation, our dedicated legal team will collect evidence, accident reports, and conduct interviews and investigations to determine who is really liable. The fault-based insurance system in Maine allows the prepared and well represented client to receive proper compensation for their suffering from the party found to be at fault. That compensation may include awards for medical expenses, lost wages as well as any out of pocket costs to repair or replace their own damaged vehicle.. If you or a loved one has been injured in a head-on collision in Maine, contact one of our veteran lawyers for a no-charge, no-obligation consultation at 1-800-INJURED.